Thanks again to everyone who joined in the Bloggers' Dinner Party in June! I know there were a number of folks who wanted to join in but didn't have time last month, I can't wait to see all your beautiful dinner items this month. I was also thinking I would broaden the party to include not just handmade items for serving dinner (placemats, tablerunners, napkins etc) as I said originally, but also include items related to making dinner - aprons, potholders, dishtowels and the like. How does that sound to you guys? In personal news, Lawson and I have been looking to make a move from DC to the Pacific NW for a while now, and things are falling into place for us to hopefully move to Portland in the August/September timeframe! We are really excited about the move but it may mean a bit of a blogging slowdown for the next few months, especially August. I am weighing options for what to do for the dinner party and considering either suspending it for a month or two, or possibly doing a combined August/September party - let me know if you have suggestions for what you'd like to have happen! In light of our impending move, I thought it would be good to give away a prize from my stash this month to help me start to make (a little) progress to reduce the amount of fabric and craft supplies I need to move. 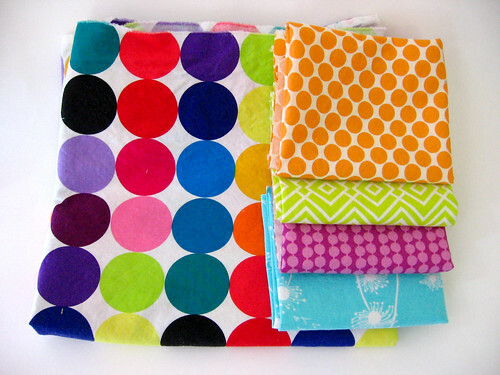 The prize will include 4 fat quarters of fabric (handcut by me, so they may not be perfectly exact) - I will update later with a list of what these specific fabrics are - and a 1/2 yard wide by about 2 1/2 yard long piece of Michael Miller Disco Dot fabric. 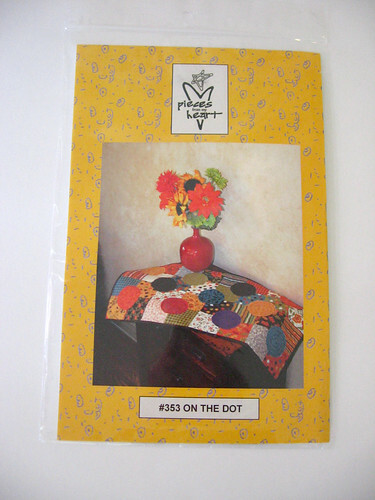 I'm also giving away this table runner pattern - I won it in a giveaway myself and while it is really cute I don't know that I will make it, so I wanted to pass it on in case someone else could use it. It calls for a charm pack of fabric, so the fabric above is not intended to be enough to make this pattern, but you could certainly use the fabric prize and add some from your stash to make it. So head on over to the Bloggers' Dinner Party Page for the linkup, details on how to enter, and the badge/button for your blog! And remember, you can enter any item you have made in the past year, as long as you put up a new post - so feel free to show off something you already made if you don't have time to whip up something new. Live long the dinner party. :) Let me know if you need someone to help you host the party for a month while you're in transition. Love the fabric and the pattern. Very cute colorful fabrics. De-stashing is difficult :-(. Have a great 4th of July weekend. Great idea to broaden the options for the Dinner Party! Love the giveaway - great fabrics! It sounds like a wonderful idea to move to Portland, good luck! I like the idea of more options for your dinner party link. I hope to have time to join in next time, and would not mind a Aug/Sept time frame at all. Hope you move goes smoothly. I am so glad it's working out for you guys to move here! I have been doing a tea towel, potholder swap and I'd love to share those. Moving though stressful can be so exciting!! And Portland is wonderful! We live 2 hours north and would love to live closer but hubbys job wouldnt work there. Got a new sewing machine and been so enjoying learning it! Made 4 quilt tops and numerous table runners, etc in the last couple of weeks, along with a dozen knit dishtowels.